One pair of high quality 7A, 12V sealed and maintenance free batteries for your battery operated stairlift. Most stairlifts with batteries require replacement every 1-3 years, depending on use. Please use the chart below to estimate the life of your batteries. 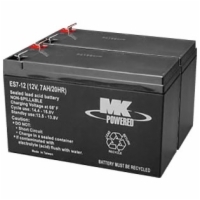 These batteries will work in most brands including AmeriGlide, Brooks, Bruno, Savaria Concord, and Summit. Customers who anticipate more than 4 round trips per day on a regular basis should consider a standard stairlift unit without batteries.